What is the practical value of Afek’s book? How many exercise are included and what can expect an average player in range from 1800-2200 Elo? Should be a publication date and an excerpt soon too. It is at the printer. who cares about pracical value? I agree with Moiseevich, please let Marin write a Leningrad book!! Almost no overlap. In this new book there are hundreds of Afek studies. I believe in ‘Extreme Chess Tactics’ there were 5 Afek studies. And in the Informant column over many years there were maybe 10 Afek studies. 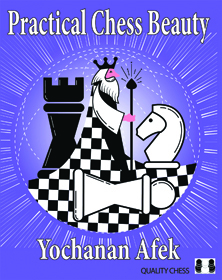 So 99% of ‘Practical Chess Beauty’ will not be found in any previous Afek book is my estimate. This is available as hardback? Could not see this on the listing in the coming soon section. The Queen’s Indian Defence – excerpt Beware – Tiger!